Digga manufactures a range of excavator hitches up to 90 tonnes. Options include single pin, double pin and cradle hitches as well as Digga’s patented Swing Control hitch and screw piling hitch (Ryno hitch). A weight reduced, non-bulky option built for micro and mini excavators up to 3T. Suits PDD-PD3 drive units. Ideal for General augering in standard ground conditions. Available for all excavators with or without quick hitch. Suits all drive unit ranges such as PDD to PD50, Supa Drives, Mega Drives, Ultra Drives, and Xtreme Drives (4,000 Nm - 500,000 Nm). 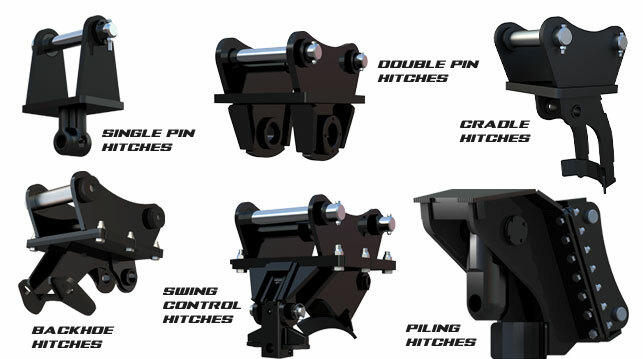 Loose pin and fixed pin options available (for machines with hydraulic quick hitch). Double pin hitch with a drive unit cradle to suit PDD-PD50. Safer maneuvering around work sites and easier connection to augers or piles. Our product quality and innovation leads the industry. 100% Australian made, designed and manufactured for Australian conditions, providing you with versatility, competitive pricing and a factory-backed warranty.